Set almost entirely in a single warehouse and focused on a group of criminals and undercover cops quickly undone by suspicion, Henry Dunham’s debut feature is undeniably inspired by Reservoir Dogs. Yet far being from a simple homage or a poor copy, The Standoff at Sparrow Creek only takes Tarantino’s film as a starting point for something more original and contemporary. After alerts about a mass shooting nearby, the members of a local militia regroup to the warehouse holding their armoury. The police already suspect a militiaman to be responsible, and when the men notice one of their rifles is missing, they realize the shooter is amongst them. Ex-cop Gannon (James Badge Dale), cleared from suspicion early on, interrogates the others one by one. Although it focuses on people who spend their free time preparing for battle, the film is carried by dialogue rather than action, and this contradiction between violence and dialogue is at the very heart of the story. Gannon’s exchanges with the other men—as well as the film’s conclusion—underline the absurdity (or impossibility) of measured conversation when guns are involved. 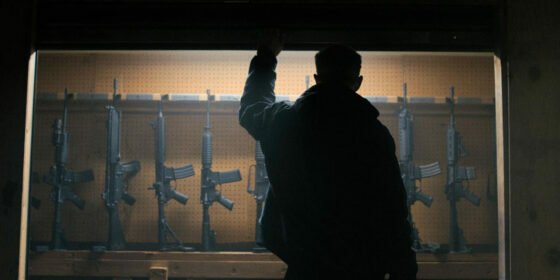 Like Jeremy Saulnier before him, Dunham offers a nuanced yet unflinching look at American gun culture and its roots in a macho, far-right mentality. Shot by Jackson Hunt, Standoff shamelessly embraces an almost distractingly Fincher-esque aesthetic (Happy Anderson, memorable in Mindhunter, plays one of the militiamen). But the engulfing darkness and digital definition of the image complement both the nature of Dunham’s concerns and the cast’s uniformly stellar performances, and also helps sustain tension and interest during some slightly too monologue-heavy sequences. One might wish for the bolts of this well-oiled machine to pop out once in a while, but Standoff remains a confident, engrossing, and memorable effort.